Help! Am I Losing My Gums Because of Gum Disease? An eroding gumline is a common dental problem often linked with gum disease. According to the Centers for Disease Control and Prevention (CDC), one out of every two Americans adults aged 30 or over have gum disease. If gum recession is left untreated, the supporting tissue and bone structures of the teeth can be severely damaged, and you may end up losing some of your teeth. However, many of the contributing factors to gum recession are easily preventable. Below is everything you need to know about gum recession and how to prevent it. Although many people assume gum loss is just part of the aging process, there is actually nothing normal about an eroding gumline – no matter your age. Gum disease, also known as periodontal disease, is the most common cause of gum recession. This type of bacterial infection destroys gum tissue and the supporting bone structure that holds teeth in place. Wear a mouth guard while you sleep if you grind your teeth at night. If your toothbrush bristles appear crushed, that is probably a sign that you are brushing too hard. Lighten up! Do your gums bleed a lot when you floss? Use a gentler touch when removing the bits of food from between your teeth. Avoid smoking or chewing tobacco altogether and try to cut back on how many energy drinks you consume. Abusing whitening strips can damage your gums. If you really want a brighter smile, talk to a cosmetic dentist about professional teeth whitening. 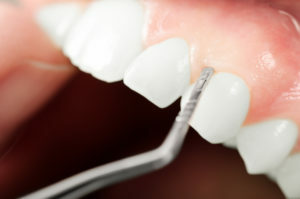 Regular trips to the dentist for routine checkups and cleanings can help maintain healthy gums. During every dental checkup, your dentist examines the health of your gumline by measuring recession and gauging the depth of your gum pockets. Sitting in the dentist’s chair is also a good opportunity to discuss with your dentist healthy oral hygiene habits and how to take care of your gums. Healthy gums are an important part of a healthy mouth. By being proactive and following the advice above, you can help maintain a beautiful and vibrant smile for many years to come! Dr. Nelson Howard is the president and founder of the West Coast Society for Cosmetic Dentistry and one of a select few dentists worldwide that have earned the distinction of Accredited Member of the American Academy of Cosmetic Dentistry (AACD). He has successfully completed thousands of hours of continuing education courses in order to provide his patients with the latest in modern dental procedures and techniques. Dr. Howard can be contacted via his website or by calling the office at 760-599-6559. Comments Off on Help! Am I Losing My Gums Because of Gum Disease?